Do you fear getting back out there to date, meet new people, or simply have micro-moments with others because you’ve experienced distrust, self-doubt and have felt heartbroken? Have you built walls to keep yourself safe from getting hurt, and the same walls that were meant to keep you safe are keeping you from meeting new people, or having deeper connections with new people, and deep-down inside you yearn to connect but don’t know where to begin, how to trust others and even yourself? If you can relate to some of what I just shared, then you’re in the right place. My name is Virginia, and over 8 years ago I experienced the above pain, doubt and even cynicism around relationships as a result of a traumatic break-up that as a result of a double betrayal. Before the event that changed my life, I felt very confident and truly was a goal-getter. But after finding out my then partner was unfaithful, I began to doubt myself, and was afraid of ever feeling shame and hurt again. The emotions were very consuming, and I would think I’ll always be single and that those in relationships are careless, until one day I recognized that I really didn’t want to be single or disconnected. I desired connections and love, and I deserved it, but how what and where would I begin. 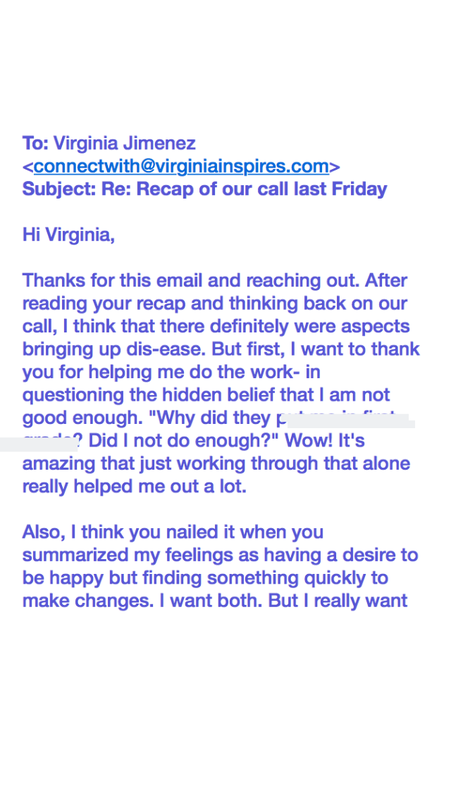 Through the years I’ve hired coaches, attended seminars, and did A LOT of personal development work on myself where I finally reached the point of feeling and owning my completeness again. I felt brave enough to take the leap to connect with others, and getting back to having a relationship with the Highest force of Love. What is Love Camp 2.0? Love Camp is a 5 part process I’ve navigated. It’s meant to support women that feel the fear and doubt , and yet are interested in moving forward towards having love in their life again. The first part of this experience will be an short 2-hour workshop. The the next 4 parts are split in two days. In the two hour workshop, we'll work on self-forgiveness and our Power of Choice. This is essentially to healing and clearing the space to allow love back into your life. "Inspiration! Virginia and the group inspired me to continue doing the work." "I very much appreciate this experience. The philosophy of "Healing Hearts" is so valuable and relevant to my life." Isn’t if interesting that you may have easily taken a vow or commitment to a relationship with someone else, and not intentionally take one for you? Love Camp Seminar on exploring our personal relationship playbook, lets us rewrite it and intentionally take a vow to love ourselves. This part of it is a 6 hour event that digs into these four areas. Trusting ourselves. Trusting others: The purpose of this section is to strengthen the ability to discern, to trust our intuition a bit, and to address moments of distrust. Women that have been having a hard time moving forward after the end of a relationship and are feeling heartbroken, doubtful, in fear of connecting again, YET they yearn for that loving experience in their lives. Before finishing high school I was dead-set on becoming a self sufficient adult; so I pursued working an internship at a mortgage company and was a sales person while attending my final years in high-school. Eventually I signed up for college and worked to pay for school. I had envisioned purchasing property and starting a family at age 23, and despite not being done with college at that time, I did it. I had set out to complete my bachelors degree from FIU in Business Administration with the thought that despite starting a family midway through school, I would finish what I started, and I did it. I set out to grow my career path in business, boldly, and I did it. But what I didn’t plan on was what life and love had in store for me after those great achievements. One afternoon in February of 2009, just a month after returning to work from maternity leave after having my second son, I found out that my former partner had an affair with my long-time friend. All of a sudden parts of me and my beliefs of love, relationships, friendships and connection seemed to evaporate and die. I had never set out to lack trust in others, to have a hard time getting back into new relationships, or to feel disconnected and lost from myself, but there it was. Life throwing a curveball in my face. I didn’t understand then and I asked myself all the questions that began with why. My mind replayed the pain over and over again many days. My self-esteem suffered as I feared looking like a fool ever again. I felt that a part of me was shattered, and I found myself numb to the idea of emotional connection. In the midst of dealing with my feelings, I had to find ways to stay centered. That wasn’t easy in the slightest bit since I was still so uncertain and unable to trust my ability to make decisions. After a year and half of a lot of back and forth with my then-partner trying to figure out if we could salvage this relationship for the sake of the kids, there was a day when my oldest son, at age 5, said to me “Mami, you’re not happy.” I will never forget the way my son looked up at me when he said that. Something awoke inside me, and a solid decision was born to nurture my soul, my spirit and my mind, because all I wanted was to raise happy children in a happy home, and I could only do that if we, their parents, were happy. I wanted them to have healthier emotional examples. Will we talk about the past and my ex-partner a lot? I’m not sure I want to go back there..
We will not look back more than needed in this space of healing. While the past has led to the current circumstance, ultimately the goal with Love Camp is to empower you to move forward confidently. The focus is YOU more than your ex-partner. How many days is Love Camp 2.0? It’s about 3 days in total, and this will be split up between weekends. This is done to give some space in digesting information and feelings you come up with. Also, it gives an opportunity to explore outside the seminar series and come back to get support from myself, the coach. How quick will I be able to see results? Results vary and are dependent on not only what is learned but the mindset outside of Love Camp 2.0, but what is put into action. Sometimes additional support is needed, so I have opportunities to support you through your transformational journey through resources and other programs. What if I just want to try Love Camp out before committing? Is that an option? Yes. This is an option. While Love Camp is a series of workshops, the first workshop is 2-hours and you can take what you gain in that one or you can continue and enroll fully in Love Camp. The investment for that first part is $75. What have others said about coaching with you? Journey to experience Love Camp Begins with an initial call to make sure this is a fit for them. If you know you’re ready to go deep, rewrite your relationship playbook and make new commitments to yourself, click the Register Now below. Have an interest in attending Love Camp? Fill out the below with your contact details. You will receive a Love Camp Guide via email.